[SatNews] JAXA is reporting that the Hayabusa2, which was launched on December 3, 2014 (JST), is now undergoing the initial functional confirmation. 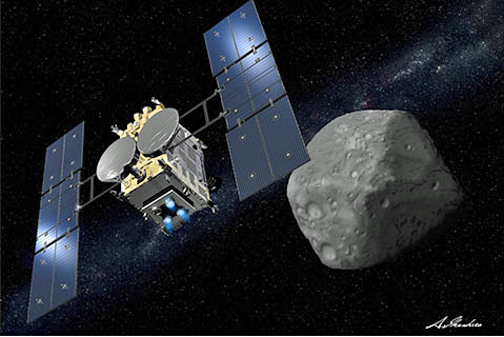 Artistic rendition of the asteroid explorer, Hayabusa 2. The satellite is going to target a C-type asteroid—"1993 JU3" to study the origin and evolution of the solar system. Image is courtesy of Akihiro Ikeshita. Ion engine test operation (one unit at a time)—Four ion engines were being operated ,one by one. A thrust of 7-10 mN was generated on the orbit for the first time. Establishing communication by Ka-band communication equipment (between January 5th to 10th, 2015)—Communication was successful between the Hayabusa2 and NASA DSN stations to establish deep-space Ka-band communication for the first time for a Japanese space explorer. Ka-band communication will be used to send observation data during the mission for the Hayabusa2 to stay near the asteroid. Ion engine can autonomously operate for 24 hours—Long duration of autonomous operation (*1) with two or three ion engines was tested, and 24-hour continuous operation was attained.The maximum thrust was confirmed to be about 28 mN, which is the expected value. The explorer is currently in good shape. JAXA will further confirm the coordinated function of multiple instruments of the Hayabusa2, and plans to move to the cruise operation phase (*2) sometime in March.